I’ve been worrying lately. “What am I going to do with my life” kind of worry. But this blog, New York Kitchen, makes me feel better. These kitchens feel so familiar. The stainless steel counters and crappy pans and piles of plates and rows of knives and white jackets and miles of labels and plastic cutting boards are all things I know well. 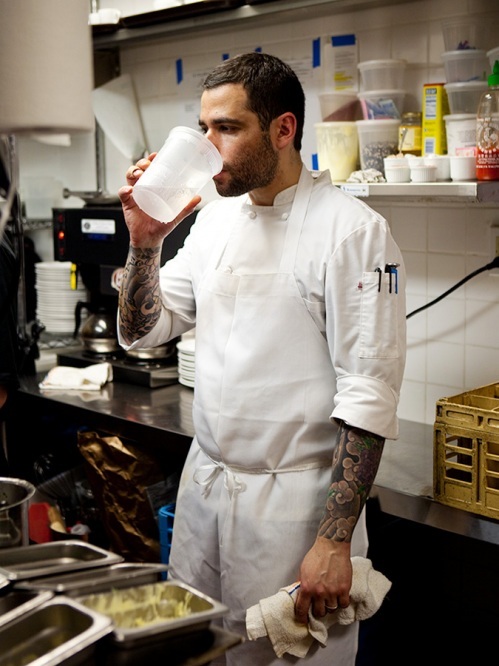 It’s strangely comforting to see a photo of this badass tatted New York chef drinking ice water out of a quart container, just like I do, just like everyone in a hot restaurant kitchen does. 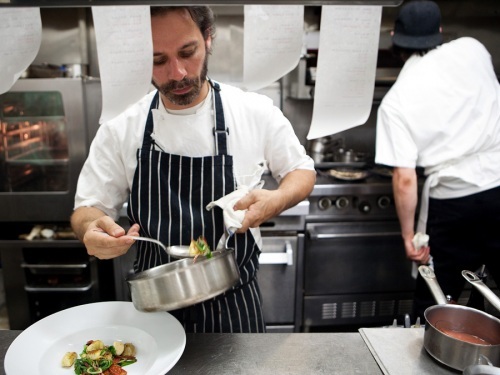 I like knowing that every kitchen will have the same NSE pans and whisks and spatulas, that every chef will yell for nine and six and half pans and I’ll know what they’re talking about. I like that everyone has the same linen-service jackets, pockets jammed with pens, sharpies, and thermometers, an apron tied over it all. Dad was telling me about a book, Shop Class as Soulcraft, written by this guy who at one point was an apprentice to an electrician and took a trip to India. He felt lost there until he stumbled upon a job site mid-wiring, and he could understand what was going on. I like that. I like that cooking is a craft. That it can be packed up in your skill set luggage and taken anywhere with a restaurant. Whenever people talk about being a nurse, a pro is always “you can work anywhere.” …People eat everywhere too. So I worry what I’ll do when I’m “grown-up.” I’m scared of leaving this pan-handled state, I’m scared of no longer being a student like I have been for a decade plus, I’m scared of choosing the wrong place to live, I’m scared of fumbling around in the world without a purpose. But wherever I go, whenever I go, there will be these same kitchens, same tongs and tickets and jackets and ovens and food and people in white jackets.